I enjoyed my first night of uninterrupted snore free sleep for what felt like the first time. Rising late in the morning to enjoy a cup of actual, legit, genuine tea and a bowl of cereal. I spent much of the day looking into my journey from Toronto to Calgary. 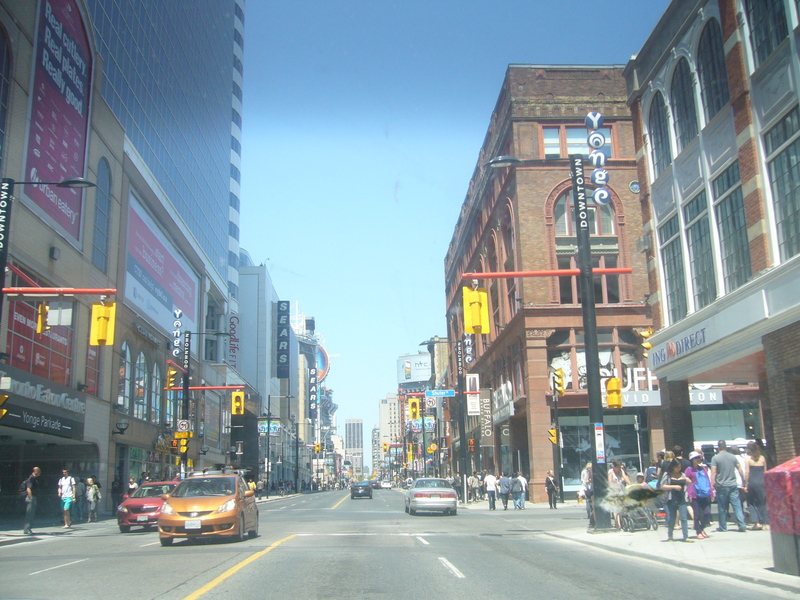 I had initially intended to make a short stop in Detroit, but a lack of places to stay and availability meant that I would be going straight to Chicago and from there it looks like I’ll probably be flying to Calgary. 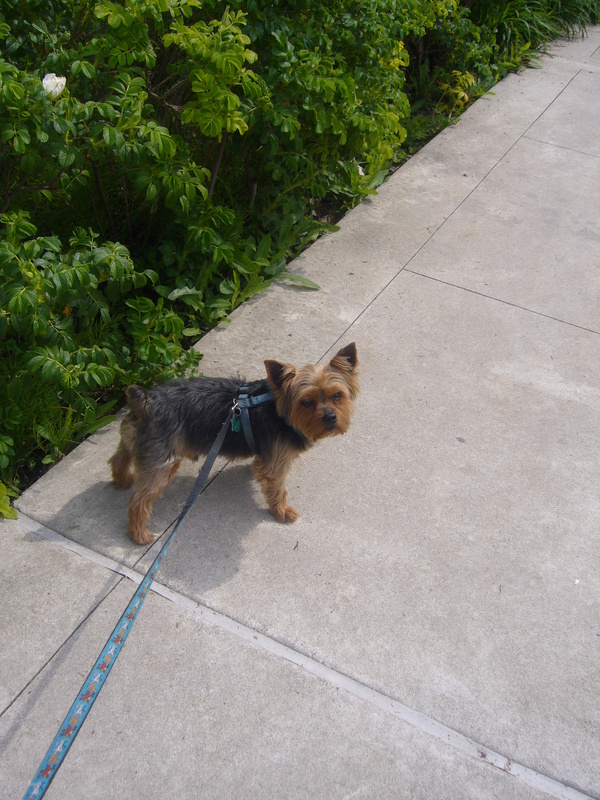 In the afternoon, I took Lisa’s dog, Che, for a walk in the local area, or more he took me for a walk. For a little fella he was a pretty stubborn little guy, if he wasn’t done sniffing the fire hydrant, we weren’t going anywhere. If he wanted to check out those dogs over there, we would go over there or we would go nowhere. 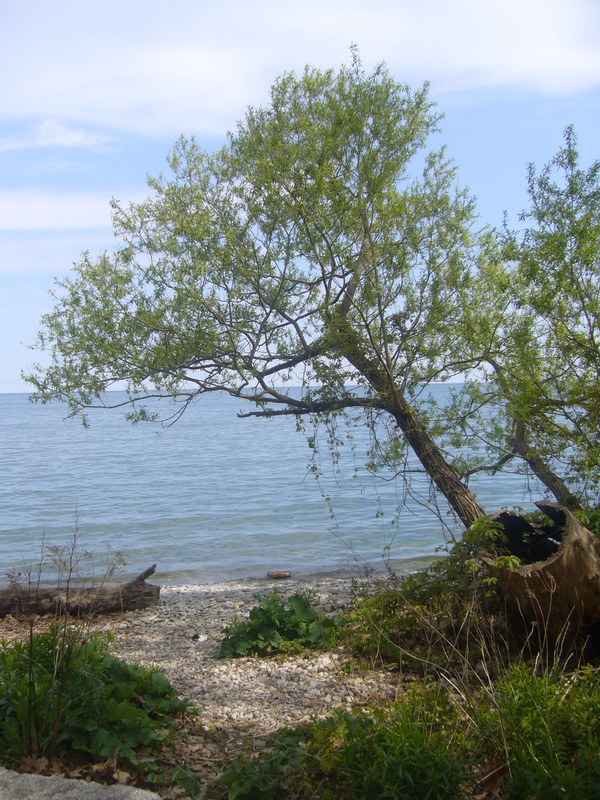 It was pleasant stroll and I made it down to the banks of Lake Ontario, for the first time really understanding why the lakes of North America are called the great lakes. After a spot of aimless wandering in a small park, we headed back. I enjoyed the housing in the area, each as unique as the next in terms of design, style size and the number of cars parked on the drive. All excellent advertisements for the bliss to be found in suburban Toronto. 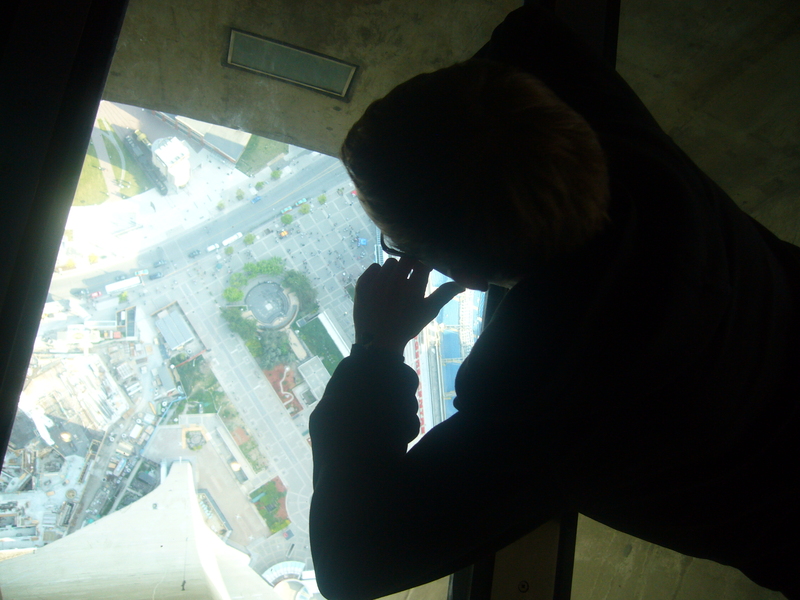 Once I returned to Lisa’s house, her youngest son, Ben, had finished school and we had agreed that once he was back we would head into Downtown to visit the CN Tower. 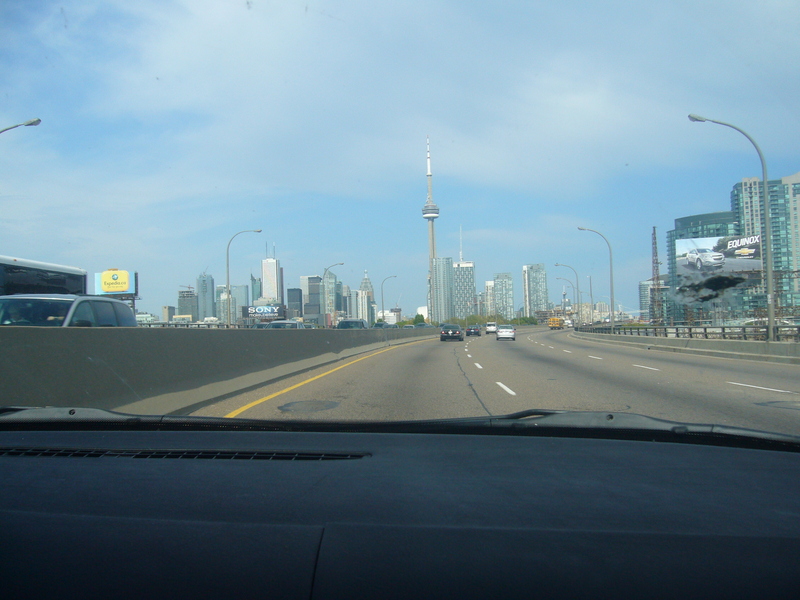 The drive into downtown is fairly impressive, the city skyline reaches right up to the shores of Lake Ontario, with apartment blocks looming over the water. 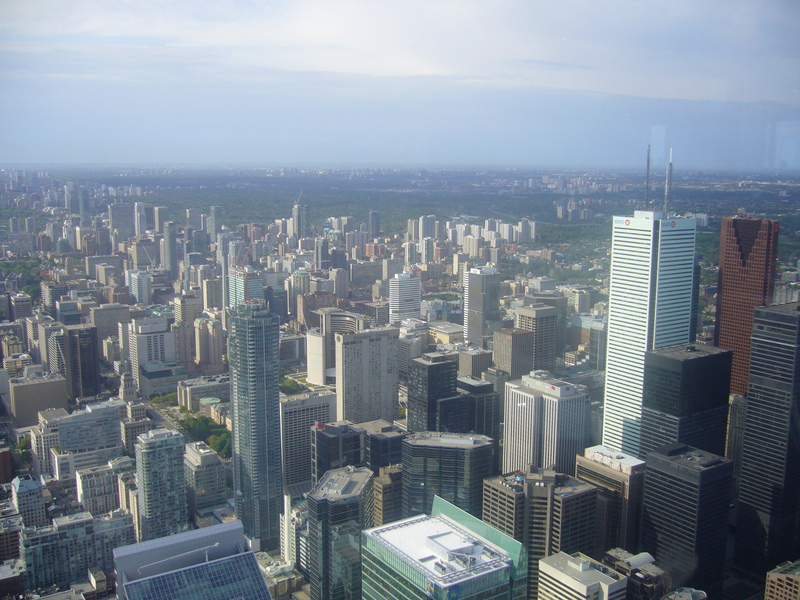 However, the CN tower is the iconic marker of the Toronto skyline. Before we were able to head to it though, it was necessary to collect my bag from the bus station which was as simple as you can imagine, unlike checking it in. 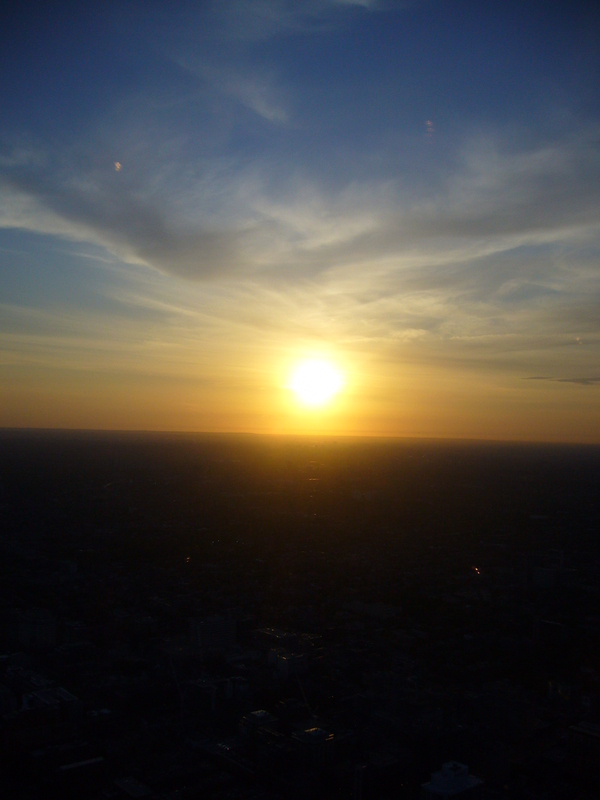 Once this was dealt with, we found a place to park and made our way into the tower where we picked up tickets to go to the top and a reservation for dinner in 360, the revolving restaurant that seems to be the main function of the tower. When completed in 1976 it was both the tallest free standing structure and tower and held both records for 34 years. It still maintains the record in the Western Hemisphere, although there is some controversy as to whether it qualifies as a building or is simply a tower. Our first stop was the Skypod, the highest observation gallery in North America. Having already been up both the Empire State Building and The Rockefeller Centre I wasn’t expecting much more from the CN Tower. Once I reached the top though, I could immediately feel the difference in height as my legs would occasionally forget what their primary function is. The next stop was the glass floor viewing deck which really brings out the vertigo. It took quite a while for me to accept that I wasn’t going to fall through the glass and walk out over the city. It’s fascinating the way that your own mind can convince you, even though you know something is perfectly safe, that if you do this; you will definitely die. A highlight of the day for me came when Lisa was about to take a photograph of me out on the glass when her own vertigo struck and she burst into laughter. She couldn’t move for several seconds and I’m not sure if this was due to the height or the fact that she was laughing too hard, but eventually we managed to get a picture taken and get back off the glass. 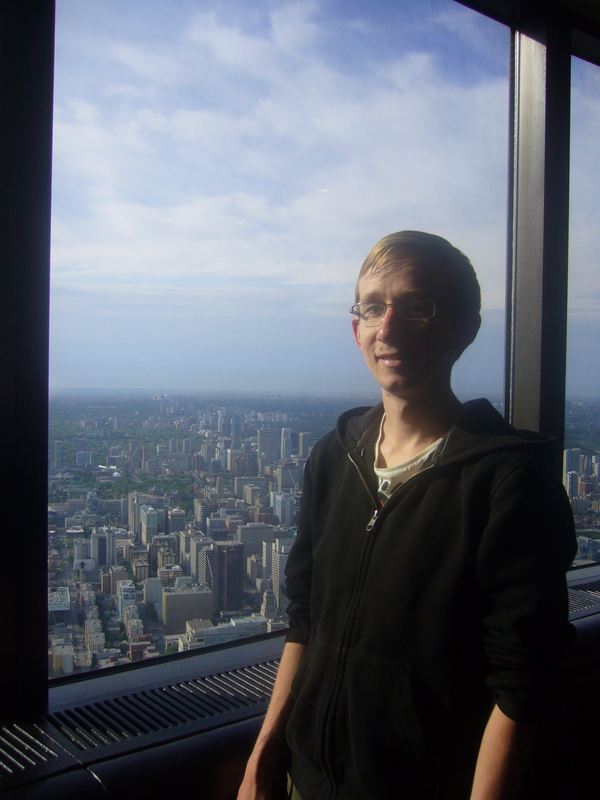 After this, Ben had decided that it was necessary to eat and we made our way down to 360, the famous revolving restaurant and were fortunate enough to get a window seat. 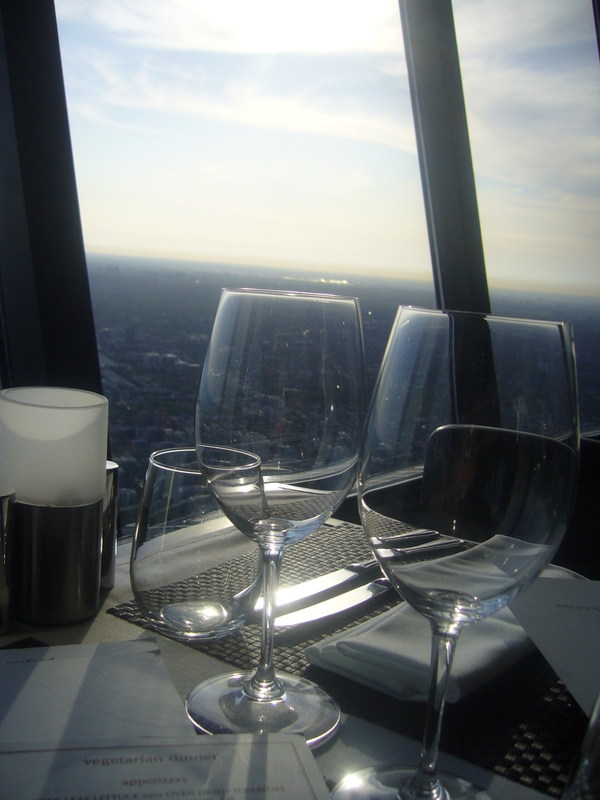 The restaurant takes around 70 minutes to completely rotate, allowing you to enjoy your meal and see all of the city. If, like we did, you plan your trip up the tower in the late afternoon or early evening you get to enjoy the city in the day, a beautiful sunset and the lights coming on across the city. As night falls you get a much better view of quite how far Toronto and the surrounding cities sprawl across the vast planes. If it’s not clear enough, if you are to come here to eat you are paying more for the view than you are for the food. 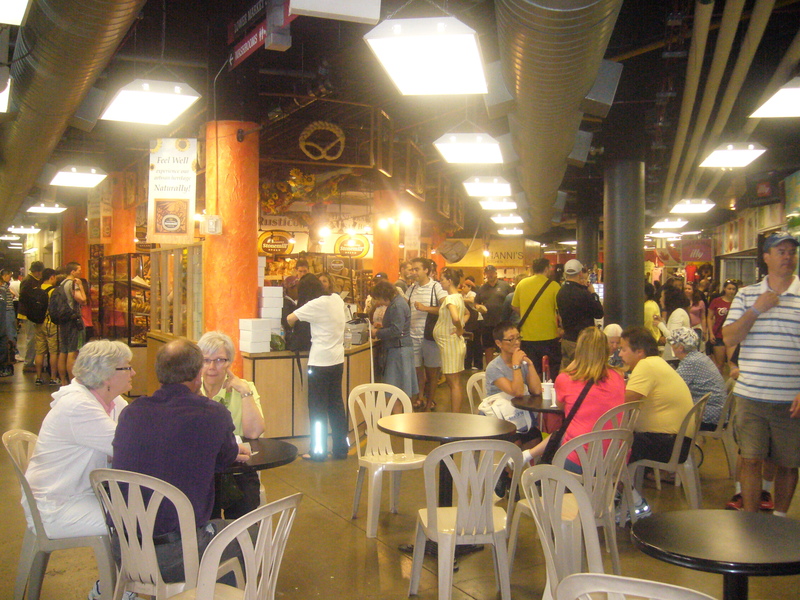 The following morning the intention was to get up early and head down to the St. Lawrence Market in downtown Toronto. 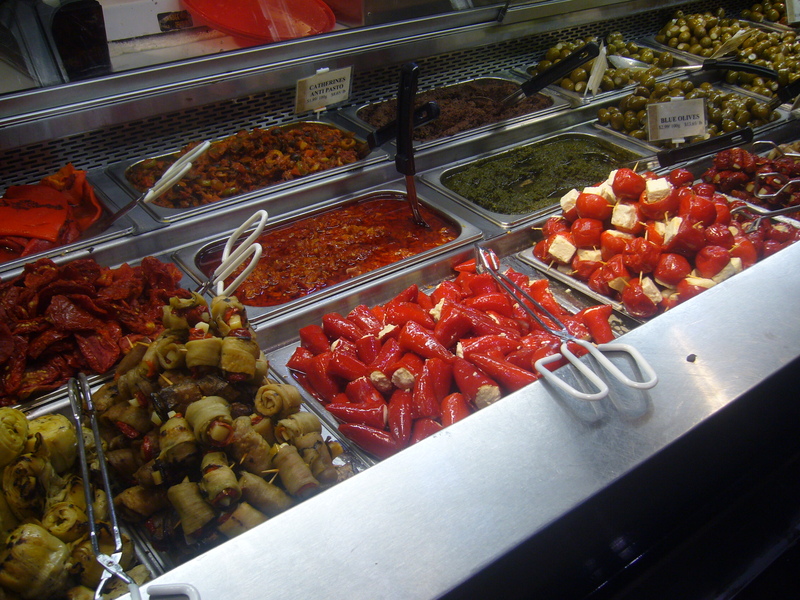 I don’t believe that there is much out there that beats the sensual overload of walking through a market. 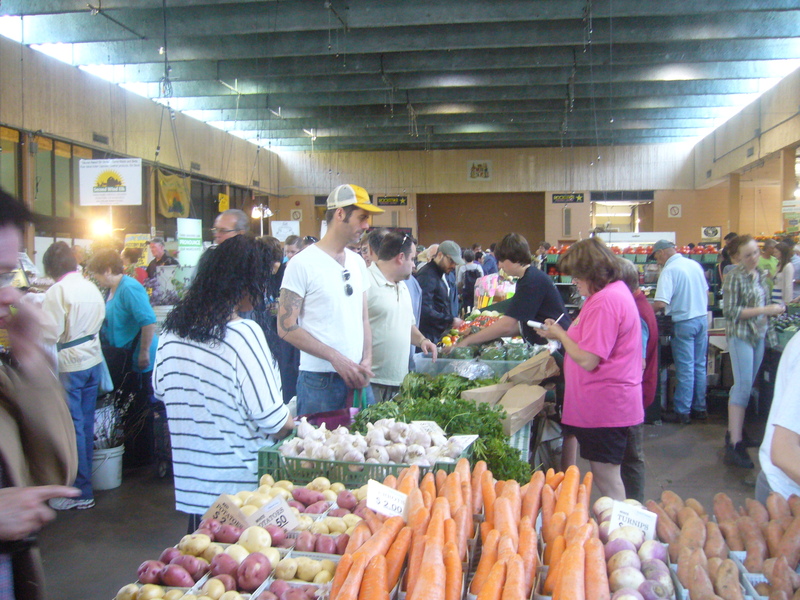 We didn’t make it out quite as early as planned, but reached the market at around half past ten. 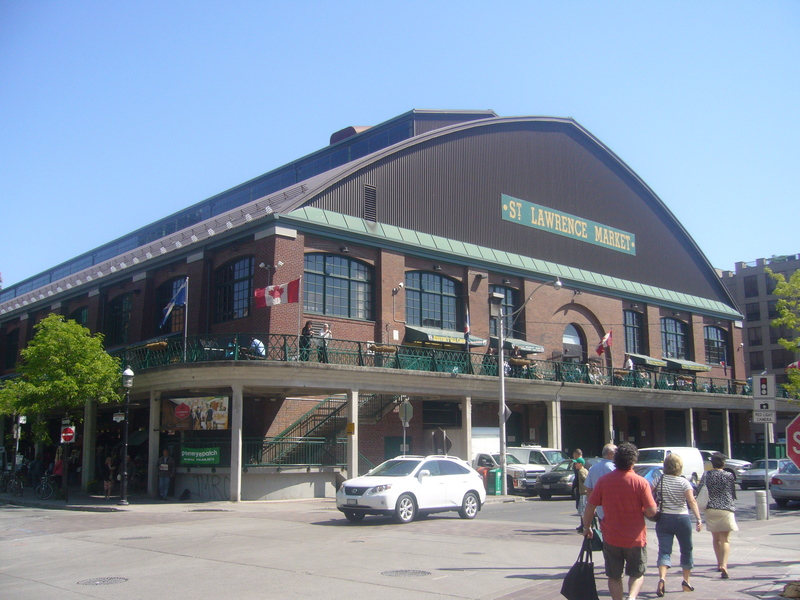 Apparently St. Lawrence is one of the most highly regarded food markets in the world and as you walk through the doors and the smells of freshly baked goods, cheese, meats and fish wash over you, you can quickly realise why. The bustling crowds mix with the pleasant stall owners, all pleased to have you check out what they have on offer; plenty of free samples to be had. 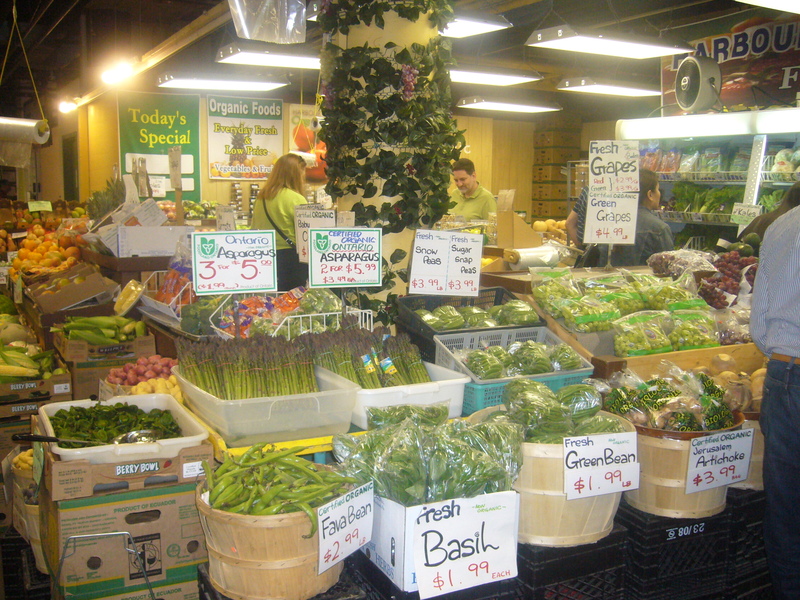 Walking through the market you pass greengrocers, where I found myself intrigued by fiddleheads, which are apparently the tip of a type of fern and are commonly used as a vegetable in salads or on their own with mayonnaise, I didn’t fancy it myself. We passed a salad bar, Lisa made note to come back later to pick up lunch for herself, while I had my eye on a vegan stall; CrudaCafe. We then passed through a sweet shop, which seemed to sell just about everything you could consider to be a sweet, including dried fruits and nuts. Lisa encouraged me to try salted corn and she picked up some yoghurt coated almonds. On the way towards the second floor we were offered a sample of a pasta sauce and after trying it, I suggested that perhaps we should get some for dinner, picking up some spinach and feta ravioli to have it with. We then continued upstairs and the change in smell every few steps was amazing. Upstairs we made a few more purchases once upstairs. The first place we came to was a huge cheese counter, I’ve never seen so many varieties of cheese in my life and my eye was first caught by the marbled yellows and blacks of an Irish cheddar with Guinness. I was curious and we made our way to the counter to see if I could get a sample. 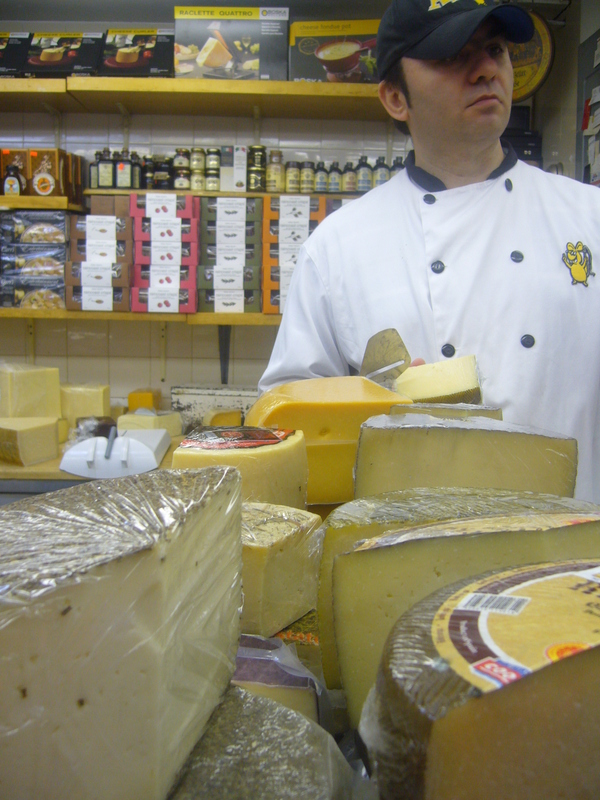 Once at the counter, Lisa and I began discussing what we liked about cheddar and upon overhearing us the young woman in front suggested that we try a slice of Beemster which turned out to be one of the best calls I’ve ever heard. Easily the best cheese I have ever had the pleasure to put in my mouth. We picked up a block of each before sampling some spicy mustard. Next we crossed the street into the farmer’s market where the stalls had been running since five in the morning and were already beginning to close down as they sold out of their fresh produce. The smells were just as intense and the vendors just as happy to offer a taste of what they had on sale, which I soon discovered was not always a good thing when I sampled a nettle tea. Once we were done here we made our way back to the main hall to pick up some lunch, Lisa grabbed a salad and I decided on a sandwich that was nothing like a sandwich. The “bread” was made from a dehydrated sweet potato pulp and the inside stuffed with salad, guacamole and salsa. Safe to say that it was delicious. Much better than the dead pigs I had seen hanging out around the meat counters. Once we had finished with the market we took a drive around the city centre, focusing on Yonge Street which is supposedly one of the longest in the world at 1896km, although this is apparently only true if it is combined with the lenght of Highway 11 so I’m not sure what to believe, but what I do know is that it stretches way beyond the limits of what I could see. 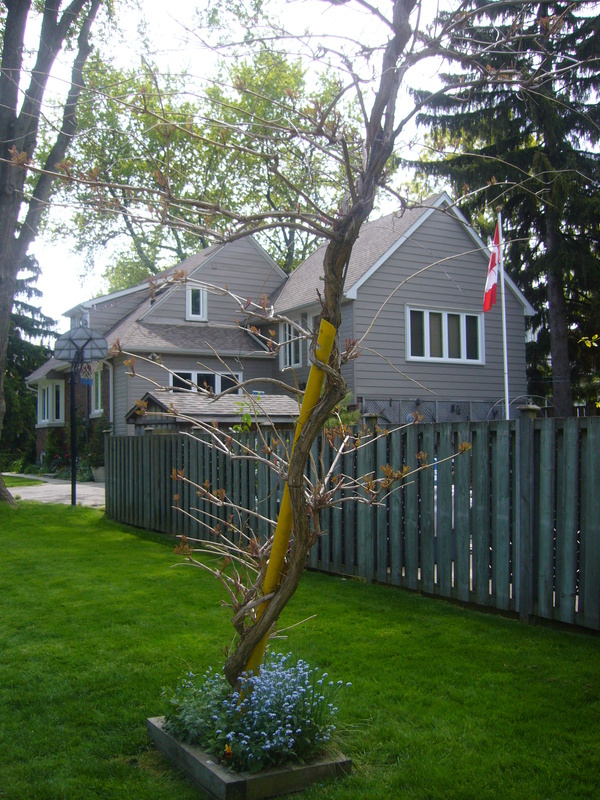 We took in the harbour area and Yorkville before moving through Koreatown and then the suburb of Swansea and one of Toronto’s nicest parks at High Park before returning home.